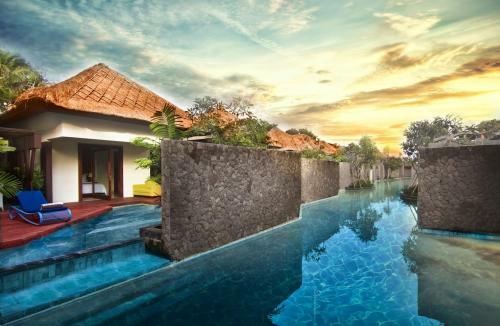 This luxury beachfront resort is 1.5 km from the Bali National Golf Club and 12 km from Garadu Wisnu Kencana park, known for its Hindu sculptures. Refined rooms with dark wood furnishings have free Wi-Fi and flat-screen TVs, as well as balconies, seating areas, minibars and rainfall showerheads. Suites – some with ocean views – offer living areas, plus in-room dining and butler services. Villas add sundecks, plunge pools and private beach cabanas. Breakfast and parking are complimentary. The resort has 3 restaurants (1 open-air), a cocktail lounge and a beach bar, in addition to multiple lagoon-style pools. One King or two Queens (by bed type request, no guarantee). Deluxe Rooms feature 48 sqm of living space, balcony, in-room WiFi, coffee maker, mini-bar and marble bathroom with bathtub and rain-shower. King or Two Twin Beds (by bed type request, no guarantee). 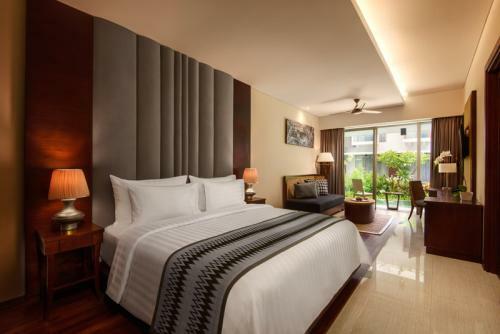 Deluxe Pool Access Rooms include 51 sqm of living space, luxury room amenities, in-room WiFi, mini-bar and coffee maker. To complete the picture, this delightful accommodation allows guests an exclusive access to the refreshing waters of the pool from a private balcony. 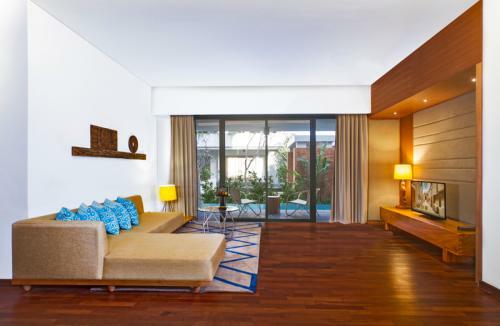 The Balinese-modern contemporary suite offers 90 square meter of gracious living space, private balcony and terrace. Extensive sets of unique services and amenities to complete the picture, these specialty suites provide club benefits, personalized butler service and pillow menu selections. Some amenities include mini-bar, coffee maker, safety deposit box, working desk and pillow selections. Reserved for family travelers or groups, the Two-Bedrooms Suite promises impeccable service and essential home comforts. 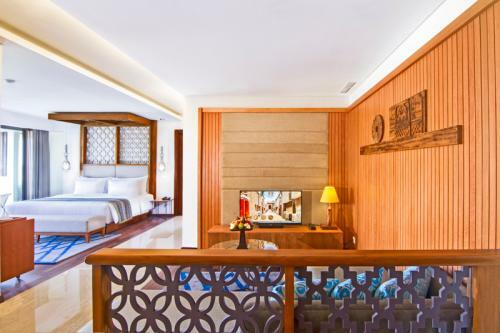 Located on the 1st level, this specialty suite includes 135 sqm of living space, two spacious bedrooms and exclusive access to the refreshing waters of the pool from a private balcony. Some amenities include mini-bar, coffee maker, working desk, safety deposit box and pillow selections. 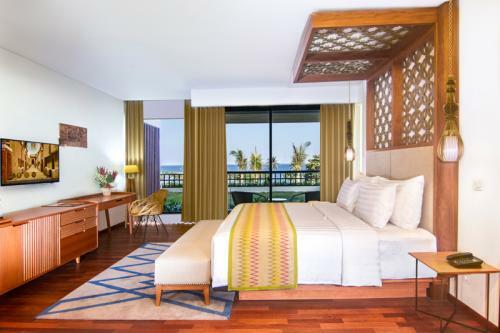 Imagine a romantic escape in this spacious 90 square meter one-bedroom suite, with breathtaking views of the ocean. Overlooking the resort’s three tier beachfront swimming pools, the exceptional services will complement measure of excellence for the discern guests. Amenities include private balcony, mini-bar, coffee maker, working desk, safety deposit box and pillow selections. 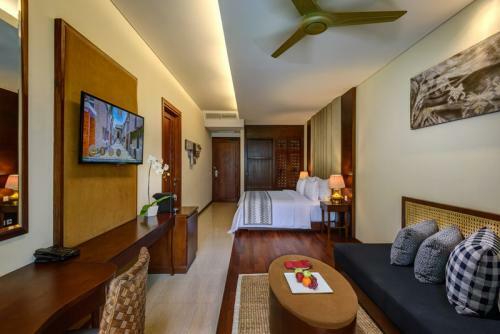 Meticulously-designed to suit your privacy, the 157 sqm One-Bedroom Villa is comprised of an oversized bedroom as well as bathroom and shower areas, laid-back outdoor terrace, tropical garden, exclusive plunge pool with connecting river-styled pool. Amenities include club benefits, mini-bar, private balcony, personalized butler service, separate outdoor bathtub and shower, safety deposit box, working desk and pillow selections.